How should America resist a fascist? Violence won’t help—not while there are still legitimate means of stopping Donald Trump. Protesters hold up signs against a police skirmish line near a Donald Trump rally in San Jose, California, on Thursday. After Donald Trump claimed the Republican presidential nomination, neoconservative scholar Robert Kagan wrote an essay for the Washington Post that made a simple but provocative claim: Trump, now a stone’s throw from the White House, was a vector for fascism. That, in running a campaign of threat and intimidation—against political adversaries, against foreign countries, against nonwhites and religious minorities—Trump had opened the door to the worst passions and darkest urges of American society. Kagan didn’t address it but his piece raised an important question, perhaps the important question of this election: If Trump is a vector for fascism—if he is a fascist, full stop—then what do we do about it? The history of the 20th century is, among many other things, a testament to the danger of popular authoritarianism and how it can overwhelm the better angels of a nation’s character to pursue its resentments with murderous efficiency. That history is why, in the face of Trump, the targets of his rage have organized against him. So far, this movement against Trump is a democratic one that utilizes U.S. laws and institutions to mount a defense against a man who threatens them, from his attacks on the idea of an impartial judiciary to his tolerance for violence and support for a herrenvolk vision of American life. On the grass-roots level, Muslim and Latino activists are working to naturalize immigrants and register them for the ballot, while civil rights groups are fighting voter restrictions that may keep them from the polls. Students and other young people are protesting Trump events to demonstrate their stance against his rhetoric and aims. On an institutional level, the Democratic Party is planning a massive campaign against his candidacy, and the press is beginning to scrutinize his life and beliefs in serious ways. Trump may have overcome the Republican Party (or at least successfully exploited its core weakness) but the rest of America’s democratic system—our institutions of self-governance, from politics to civil society—has mobilized in response to Trump’s illiberalism. Trump doesn’t just promise conservative policy—he isn’t a typical Republican presidential nominee whose views may offend liberals but don’t pose a threat to basic American institutions. His contempt for political norms, his attraction to violence, his bid to be Strongman of the United States of America all constitute a deadly threat to American democracy and an existential threat to Americans in Trump’s crosshairs. If we are living in an extraordinary moment, is it time for extraordinary action? 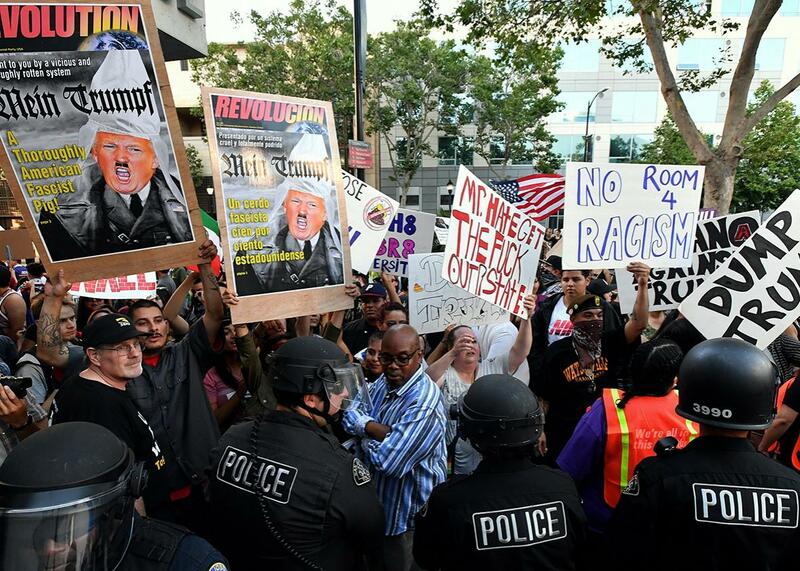 Which brings us to Thursday’s events in San Jose, California, where a group of anti-Trump protesters turned to violence against Trump supporters. Most of the anti-Trump action was peaceful, if aggressive. But some members crossed over into attacking attendees at the Trump rally. One supporter was pelted with eggs and water bottles, while others were punched and assaulted. Eventually, police moved in and stopped the scuffle, which left several people injured. There is a flash of truth in this response. However wrongheaded their methods, the protesters are correct in their estimation of the election’s stakes. And this kind of extra-democratic political violence (as opposed to wars and revolutions) has been used in service of basic rights and liberties, as we’ve seen in the movements for abolition, workers’ rights, and civil rights. But there’s a vital difference between the disorganized street fighting in San Jose and confrontations like the Battle of Blair Mountain in the West Virginia of the early 20th century. The latter was defensive action against armed anti-union opponents as much as it was a proactive use of force. The same is true for anti-slavery violence, which—as Abraham Lincoln starkly noted in his Second Inaugural—was defensive violence against the blood of the lash and the bondsman. Compare that with the fighting on Thursday. Those Trump supporters weren’t members of an armed Trump militia, or shock troops of a reactionary force, or a band of vigilantes. They weren’t an armed or active threat to anyone. And even if they hold odious political beliefs, it’s their right as Americans to assemble peacefully in support of them. It may be the duty of the public at large to beat Trump supporters at the ballot box, but backing the real estate mogul doesn’t mean they’ve forfeited their status as citizens. It doesn’t mean they’ve opened themselves up to physical attack. But there’s a deeper problem. To attack someone because of their political beliefs is to embrace the logic of authoritarianism. To cite intentions and not actions as justification for violence is to embrace the logic of even worse beliefs and actors. We have to get them before we get us isn’t “direct action”; it’s mobocracy. And it runs counter to the liberal democratic ideal—the thing we’re defending in the first place. Again, this isn’t a question of protest. Protest is a vital part of democratic life. It isn’t a question of resistance; everyone is entitled to stand against attack. This is a question of aggression. Donald Trump is an authoritarian, but the United States in 2016 isn’t Weimar Germany. Our democracy has deep roots and our institutions are sturdy, if aging. We don’t have private paramilitaries in the streets or an established order with a blind eye to reactionary violence. There are times when political violence is effective, even permissible. Now is not one of those times. Americans—and those on the left, in particular—have every tool needed to stop Trump. We can use those tools, which show every sign of working. Or we can choose the other option, the one that clears the path to genuine bloodshed. But here’s why we shouldn’t: The simple truth is that reaction feeds on disorder. And when there are legitimate means to stop Trump, you’re just as likely to cause a backlash in favor of his effort by forsaking them to attack his supporters. (At the risk of tripping Godwin’s law, German Communist violence against ultra-right targets in the 1932 elections didn’t stop Hitler and his enablers as much as it emboldened and enabled them.) If anything, Trump wants violent attacks on his supporters. Don’t give them to him. Which is to say that, yes, we can open the box labeled violence, but consider this: There’s little guarantee we’ll be able to close it and almost none that we’ll prevail in the end.